Sayer polled in 2043 votes while Pathirana was placed second with 1679 votes. 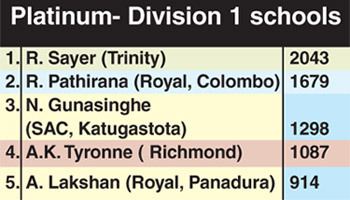 Katugastota Anthonian Nimesh Gunasinghe, A.K.Tyronne the Sri Lanka schools representative at the coming Under 19 World Cup in two weeks time in Dubai and Akila Lakshan from Royal College Panadura are the first five contestants to take off the blocks in the Platinum category for division 1 schools. 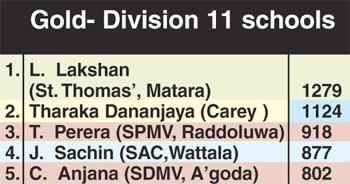 In the Gold segment for division 11 schools Lasith Lakshan from St. Thomas’ Matara who was also a Sri Lana Schools representative took top billing with 1279 votes and Tharaka Dananjaya of Carey College ,Colombo was placed second with 1124 votes. 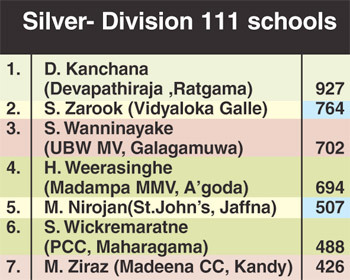 The third segment ‘Silver’ for division 111 schools had the most number of contestants with seven. Dilshan Kanchana from Devapathiraja College, Ratgama who represented the schools under 19 team at the last tour of Bangladesh was placed on top with 927 votes to the 764 received by number two Saaji Zarook of Vidyaloka Ciollege, Galle.